» Forum » Tech » Tech: Early solid state » Flash extra fuses? I figured out the fuses for Flash and installed them onto the power supply and one under the power supply, but my game has a section for three fuses where as other Flash games only seem to have one. 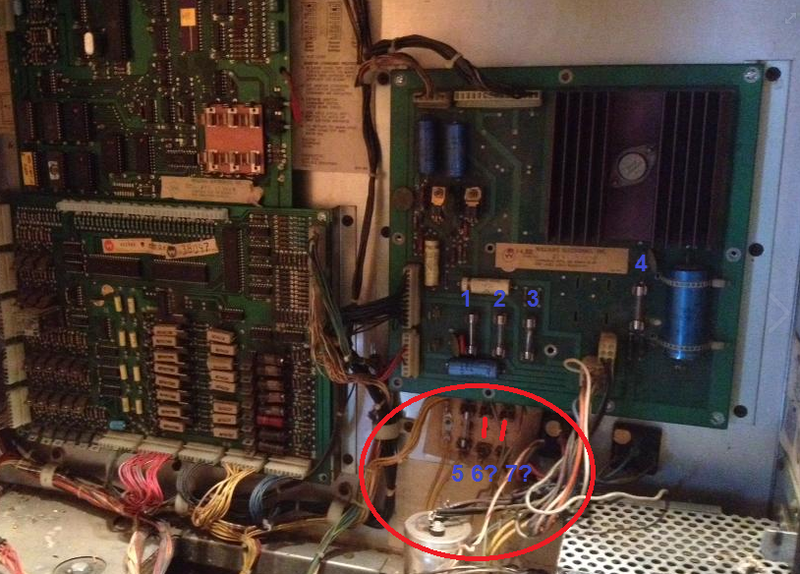 Both of them come off of / go to gray wires which seem to go to the sound board in the body of the cabinet, there's three wires I believe which go to it and two of them are fused. It doesn't seem other Flash machines have this (just the fused yellow), is this just something extra which is factory or not? What do I put in here? There is also another yellow wire connected next to these fuse holders but it does not take a fuse and is connected directly. The information I got from somebody only had information for five fuses which match these values but nothing on the other two. Other "Flash" pinball machines only seem to have one fuse and holder at that position. don't know but i would fuse those two bridges. fire hazard otherwise. Each side of both of those fuse holders have a wire soldered to it so they're not un-used. I looked up what the wires were that go to the soundboard molex and they fused the 12V and -12V that goes to the soundboard (fitted in the body for Flash) if the wires are running where I think they are. The soundboard also has the appropriate fuses fitted to itself which were there when I got it. I'll check the wires once I get back there again but they're the same color and I believe I checked it already, but I don't know for sure. Only get to check the machine on weekends for right now, damn. This almost looks factory though. Weird. There's also a fuse diagram below it but I think that one is for the power supply fuses and not those fuses in particular. I still haven't got the game running so I just wanted to cover my bases before I started to troubleshoot further, I'm still waiting for my power supply caps to come in the mail. This shouldn't be an issue and I should be only missing sound without fuses in there it seems. but for lamp/solenoid, not sound. You might PM hime since he's bound to know a reason (good or bad) this was done. Thanks. These are the wires which are fused on my machine in addition to the yellow fused wire shown in his picture. Irrelevant to the guide, but does anybody know what the purpose of these are? Thanks so much all! 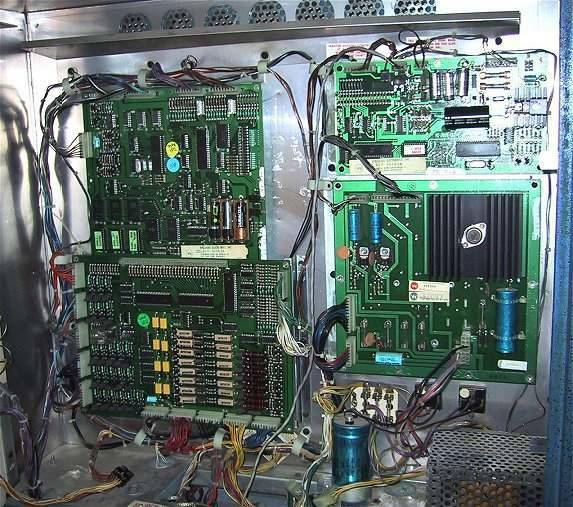 Found this picture online which also has the same fuse setup in the lower right corner. (Not Flash either, as the soundboard is mounted in the head / backbox). Well I have a flash if you need picks or help. Sound fuses on mine are on the sound board I believe. It may be a stituation where at some point they had no fuses on sound board then some with. It was a huge run with sys3thur sys 6 boards. So you may just have double sound board fuses. And that has fuses on sound board as well weird. I'm thinking they might be HV related now and not to the sound board, possibly? The gray shrink-tubing covered wires coming down from the top left of the power supply in the last picture I posted are the ones I might have been thinking of, but then again, they'd be going up in this pin as the sound board is in the backbox so I'm not sure what they do but I can see it going down into the body of the pin here too. Still, not the same set of wires which are fused in my machine so I must be wrong thinking they are sound related. My pin also does have fuses on the sound board so I'm thinking these wires are not related to the sound board and are used for high voltage or to power something else. If you could track them down on your machine (direct lower right corner inside of the backbox if you're looking into it) that might help. Two posts ago I posted a picture of those gray wires which are molex'd. 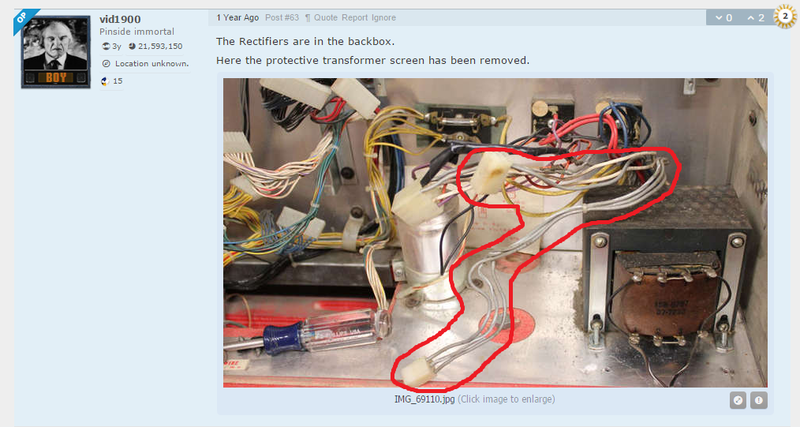 Found that picture on the internet but I am positive two of those wires are the fused ones. This seems to be popular in System 3 games and my power supply has the yellow colored caps used in only Hot Tip and Lucky Strike (I read those were no longer on the power supply when Flash came around, but maybe they were left on and just not used? I don't know) yet my pin has a System 6 CPU board so some or a lot of it must not be original but that shouldn't matter.